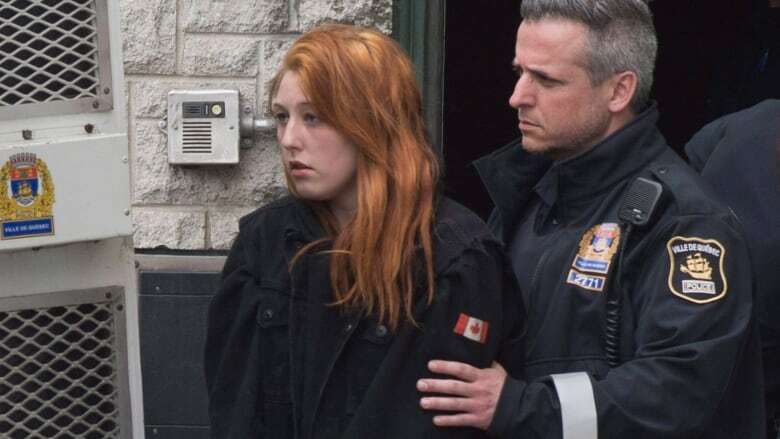 Audrey Gagnon, 23, appeared in court this morning to face the murder charge and a charge of committing an indignity to a body, in connection with the death of her two-year-old daughter, Rosalie. The mother of a two-year-old girl who died in Quebec City last week has been charged with second-degree murder and committing an indignity to a dead body. Audrey Gagnon appeared in Quebec Court this morning, dressed in a plaid shirt and wearing handcuffs, to face the charge in connection with the death of Rosalie Gagnon. The proceedings lasted less than two minutes. Gagnon looked out briefly at the packed courtroom before lowering her gaze to the ground. The toddler's body was found in a garbage bin at a suburban home on April 18. Police said she had been stabbed to death. Gagnon, 23, was already in custody after being charged with breaching probation, obstructing the work of a police officer and mischief. The Crown will now have six more weeks to go through the evidence it has gathered and then present it to a judge. Crown prosecutor Mélanie Dufour said there will not likely be any further charges laid against Gagnon. "It's a second-degree murder charge, and I think it speaks for itself," she said. Gagnon will remain behind bars until her next court appearance on June 13 in Quebec Superior Court. The investigation was triggered following the discovery of an empty stroller near a park, and the mother was tracked down and arrested a few hours later. A silent march was held Tuesday evening for the young girl. Quebec's minister for youth protection has also said she is seeking an inquiry into the girl's death. A Quebec organization that represents the families of people who have been killed or who have disappeared, known by its French acronym AFPAD, has been appointed to speak on behalf of the toddler's family. Nancy Roy, the group's director, told Radio-Canada that initially, no one came forward to claim the young girl's body. "The funeral home, the Montreal morgue and the Quebec City morgue rallied together, and finally, it was an uncle who decided to take charge of Rosalie's funeral," Roy said. That funeral is to be held May 5 in Quebec City.